Lego Club Penguin: Support #LEGOCP! Hey everyone! 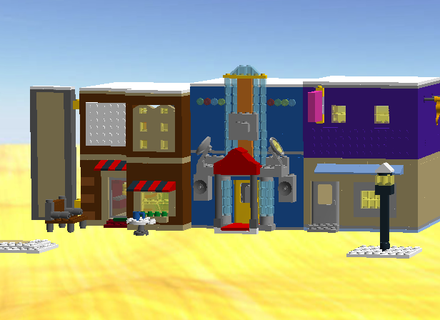 My friend, @GreenNinjaCP, has put up a suggestion on the Lego Ideas website and he suggested that Lego make a Club Penguin lego set of the town! This has been an on going project that has been running for a more than a year now. 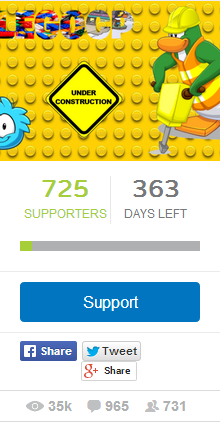 As of right now there are only 725 supporters and we have about one year to reach 10,000 supporters. With your help we can reach this goal! All you have to do is click the blue button that says support on it. It's fairly easy to become a supporter but if you need instructions read below. 1. Support right here https://ideas.lego.com/projects/34511. How do you support, you ask? If you already have a Facebook or Twitter account, you can create an account with no hassle at all using that login. If not, it only takes about a minute to make a LEGO ID to support a project. To support, just click the big blue SUPPORT button on the page I linked, and login. Then, fill out the little form by checking off the options. Supporting does not obligate you to buy the product once it has been released. 2. Advertise! Post it on your fan cheats blog. Tweet it out with #LEGOCP. Tell your Facebook friends! Tell your real life friends! Tell everybody on wiki chat! Just do it. There are links under the support button so you can share this project easily. Why should you support? For a few reasons, actually. 1. There hasn’t been new Club Penguin merchandise in so long! Don’t you want to fill that gap with something awesome, like LEGO? Everyone loves LEGO! At least, I hope they do. 2. You’ll be doing a favor for the entire community. Wouldn’t it prove how amazing Club Penguin players are to have 10,000 people support and change the history of the game forever? 3. It doesn’t hurt to support. Even if you don’t want a Club Penguin LEGO set, just be nice and help! It only takes a minute or two. What do you think? Will you help support and buy a set if one were to release? I hope you take the time to help. Let’s do this!